Garni is on the road to Geghard and both can be comfortably seen on the same day. Halfway to Garni however, take a few minutes to look at the Charents Arch. The arch itself is not what you stop for, but for the great view of Ararat which it frames on a clear day. Truly a Kodak moment. When you get to Garni, it will remind you of a somewhat plain Parthenon. It was built in the first century A.D. by the Armenian King Tiridates with the money he received after visiting Emperor Nero in Rome. The temple was destroyed in 1679 in an earthquake, but was reconstructed in Soviet times. (You can recognize the new stones by their lack of carving, which allows you to appreciate the originals.) It is an excellent reconstruction and a very worthwhile place to visit. You can even see carved graffiti in Arabic... There are also ruins of mosaic ancient baths and residences in Garni. If you came in a car (not bus) or can hike, take the time to go down to the very worthy Garni Gorge, and maybe hike up to the extensive and virtually unvisited ruins of Havuts Tar Monastery. The fortress of Garni is situated in the village of the same name in the Abovian District. That was a mighty fortress well known from chronicles (Cornelius Tacitus, Movses Khorenatsi, etc.). The structures of Garni combine elements of Hellenistic and national culture, which is an evidence of antique influences and the distinctive building traditions of the Armenian people. The artistic merit and uniqueness of its monuments place Garni among outstanding creations of architecture of world importance. The structures of the fortress of Garni are in perfect harmony with the surrounding nature. The fortress is situated in a picturesque mountain locality and commands a broad panorama of orchards, fields and mountain slopes covered with motley carpets of varicoloured grasses, of the jagged and precipitous canyon of the Azat river. 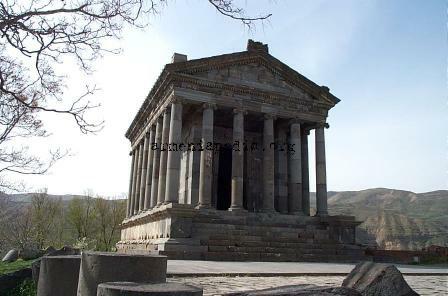 The fortress of Garni stands on a triangular cape which dominates the locality and juts into the river. A deep gorge and steep mountain slopes serve as a natural impregnable obstacle, and therefore the fortress wall was put up only on the side of the plain. It was put together of large square-shaped slabs of basalt placed flat on top of each other without mortar and fastened together with iron cramps sealed with lead. The evenly spaced rectangular towers and the concave shape of the middle of the most vulnerable northern wall, which increased the effectiveness of flank shooting, added much to the defense capacity of the fortress and, at the same time, enhanced its artistic merits. The palace complex included several disconnected buildings: a temple, a presence chamber, a columned tall, a residential block. a bath-house. etc. They were situated around the vast main square of the fortress, in its southern part, away from the entranceway, where they formed all ensemble. In the northern part there probably were the premises of the service staff, the king’s guards and the garrison. The summit of the cape was crowned with a temple which overlooked the square by its main northern façade. The temple, the artistic center of the complex, is on the central axis passing through the fortress gate. The temple was built in the second half of the first century B.C. and dedicated to a heathen god, probably to Mithra (Mihr in Armenian), the god of the sun whose figure stood in the depth of the sanctuary (naos). After Christianity had been proclaimed the state religion in Armenia in 301, the temple was probably used as a summer residence of the kings. A chronicle describes it as ‘‘a house of coolness’. In its style, the temple, a six-column periptere, resembles similar structures in Asia Minor (baths at Sagala and Pergamum), Syria (Baalbek) and Rome. Its architectural shapes are basically-Hellenistic but local traditions also show in it. It should be noted that a rectangle-based religious edifice with columns and a pediment was known on the territory of the Armenian upland back in the epoch of the Urartians; such, for instance, was the temple in Musasir (the 9th‑8th centuries B.C. ), a representation of which can be seen on an ancient Assyrian bas-relief. Quite possibly, this type of architecture influenced the overall composition of Armenia's heathen temples in general, and that of Garni temple, especially the outlines of certain details and the interior decoration. The temple stands on a high podium with a two-step base and is surrounded with 24 Ionic columns. A broad nine-step stairway leads up to the podium. The sides of the stairway are decorated with bas-relief, placed symmetrically relative to the main axis of the building, showing kneeling Atlantes with uplifted hands who seemed to support the torches which used to stand higher. This sculptural motif is flown from later monuments of East Roman provinces, such a Niha in Syria (the first century A.D.). In front of a rectangular stone-floored naos there is a shallow pronaos with antae and an entrance-way framed in a platband. The small size of the sanctuary shows that it contained only a statue of the deity, and that worship was performed in the pronaos. The bases of the columns resemble those of Attic temples in their shapes, the shafts are smooth, the Ionic capitals are decorated with clean-cut moulded, rather than hewn, volutes and ovae and leaf ornaments which differ from column to column — a characteristic feature of Armenian monuments. The shape of the corner capitals is most interesting — on them as distinct from the inside columns, the volutes of the adjacent front sides are turned at a right angle, and the floral ornament of the lateral sides are more graceful in their composition. The richly ornamented entablature is distinguished by the overhanging upper part of the architrave and frieze. This feature is also to be seen in the later monuments of Syria (2nd century) and Italy (4th century). As distinct from these works of Hellenistic art, however, the ornamentation of the entablature of Garni temple is more variegated. The frieze shows fronds of acanthus combined with flowers and rosettes of various shapes and outlines. Besides acanthus, it also features laurel and oak leaves, as well as grapes, pomegranate and other floral motives characteristic of the Orient. The cornice is ornamented with dummy spillways shaped as lions’ heads with bared teeth. These, along with oxen, often occurred in Urartu murals, on arms and seals. Contrasting with the flat bas-relief leaf ornament of the cornice, they created the rhythm of the crowning details of lateral façades, connected with the columns. The pediment was smooth. The soffits of the architrave, the ceilings of the portico and the wings of the temple were decorated with floral ornaments, octagon and diamond-shaped ornamented caissons. Carving on hard basalt, rather than on the soft marble characteristic of Roman architecture, is evidence of the fact that all structures in the cities of that epoch — Armavir, Yervandashat, Vagarshapat, etc. — were created by Armenian craftsmen. Their style shows in the variety of ornamental motifs, in the depiction of specimens of local flora in ornaments and flat carvings. The temple’s proportions differ somewhat from the proportions of other antique structures. Its composition is based on the contrast between the horizontal divisions of the podium and the entablature and the vertical columns which rose sharply against the background of the sky. The temple makes an impressive sight from many remote and close observation points. A two-storey palace situated to the west of the temple was another edifice distinguished for its artistic merits and size (about 15 by 40 m). Its southern part, a presence chamber 9.65 by 19.92 m, was an oblong premise, its ground floor roofing resting on eight square pillars arranged along the longitudinal axis. The walls were punctuated with pilasters, aligned with the pillars. There were niches between them. A rectangular premise at the north-eastern fortress wall, dated the 3rd‑4th centuries, had a similar composition. Just as in the columned hall of Bagineti fortified town near Mtskheta, Georgia, its wooden roofing rested on the inner wooden pillars with stone basis and, possibly, with carved wooden capitals. It seems that the longitudinal side of this architecturally richly decorated premise had wide openings affording a view of the beautiful panorama of the green valley of the Azat river and the picturesque slopes of the far-off mountains. The northern part of the palace was taken up by residential quarters. Judging by the fragments that have survived to this day, the composition of the façade of this part, which overlooked the square, had risalitas. The premises of the basement served auxiliary purposes. One of them was a winery, for instance. In one of the rooms one can see traces of dark-red plastering, which seems to indicate that the residential and presence chambers of the palace were richly ornamented. The bath-house is situated in the northern part of the square. at an angle to the residential block. Built in the third century, it comprised no less than five premises serving various purposes, four of which had apses at their end walls. The first apsidal room from the east was a dressing room, the second one, a cold water bathroom, the third and fourth ones, warm and hot water bathrooms respectively. The bathhouse had a water reservoir, with a heating room in the basement. The floors were faced with baked bricks covered with a layer of polished stucco. They rested on round pillars and were heated from below with hot air and smoke which came to the underfloor space from the heater. A notion of the interior decoration can be obtained from the fragments of two-layer plasterwork which survived in several rooms — the white lower layer and the pink upper layer — as well as from the floors with remnants of stone mosaics of 15 hues. 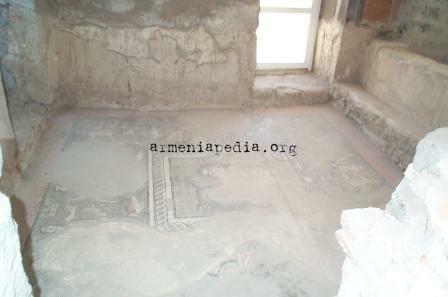 Of special interest is the soft-colour mosaic of the dressing room floor dating back to the 3rd‑4th centuries, an outstanding example of monumental painting in central Armenia. The theme of the mosaic decoration of the 2.91 by 3.14 m floor draws upon Greek mythology. Against the light-green background, representing the sea, there are inlaid pictures of the gods of the Ocean and the Sea, framed with a "wattled" ornament, fishes, nereids and ichthyocentauri. A wide pink band runs the perimeter of the mosaic. The tonal transitions of the water surface create the impression of wave movement. Greek inscriptions name the deities and nereids which are skillfully executed by craftsmen who obviously had a good knowledge of anatomy. Human figures with faces of Oriental type are depicted in a most specific manner. A Greek inscription over the heads of the gods says: "Work and gain nothing." The bath-house of Garni. in its composition and in that it had rooms with various temperatures with the hypocaust heating system, has much in common with the antique bathhouses of Syria and Asia Minor, especially with the bathhouses in Mtskheta — Armazi (2nd‑3rd centuries) in Georgia, in Dura-Europos and in Antioch on the Orontes (3rd century). On the fortress grounds archeologists found fragments of various works of art. Among them a marble torso of what looks like a man’s figure in anitique attire merits special attention. The torso is harmoniously proportioned. The folds of an engirdled tunic draped around a calmly standing figure are well rendered. The figure has much in common with a marble woman’s figurine found in Artashat and dating back to the end of the 2nd and the beginning of the first century B.C. Also well preserved is a great number of superbly executed fragments of column bases, plasters, window and door plathands, cornice stones, etc., which undoubtedly belonged to various monumental buildings. Judging by the remnants, one of these buildings was a four-apse Christian temple of the 7th century built in place of the ruins of the palace’s presence-chamber. Numerous structures on the territory of the settlement adjacent to the fortress as well as handicraft articles indicate a high level of Christian art which flourished there in the 4th to the 17th centuries. The monuments of Garni show that although Armenia’s Hellenistic architecture was connected with the architecture of Hellenistic countries, it had distinguishing features all its own. This page was last edited on 15 October 2010, at 01:22.